Other parties believe in globalisation, privatisation, and economic growth at any cost. Islanders know that the Green Party is different. 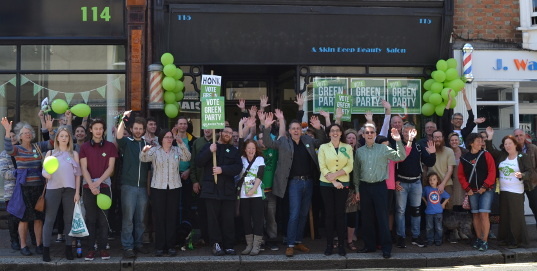 The Green Party wants a better deal for the Island from national and local government. The Isle of Wight is the best place in the world. Let's make sure it gets even better. Vix Lowthion's 12,915 votes on the 8th June 2017 were the second highest for the Green Party nationally, by either total votes or vote share, bettered only by sitting Brighton MP Caroline Lucas. Vix's 17.3% vote share in a six way contest beat Liberal Democrat, UKIP and independent candidates and was up 37% from the 9,404 votes that Miss Lowthion received in her 2015 breakthrough on the Island. That was one of the highest results for the Green Party in the whole of the UK that year, beating Labour, Liberal Democrat and independent candidates on the Island. We also stood candidates in the majority of seats for the County Council election on the 4th May 2017. Our candidates saw an average 58% vote share increase since 2015, receiving more votes overall than Labour, the Liberal Democrats or UKIP. The Green Party gained a new County Councillor in Ryde East and another thirteen local councillors.